OK, this is still confusing, but maybe not totally confusing. Depending on their game this afternoon with the Black Hawks and the Kings game at Colorado (both at 3 p.m. 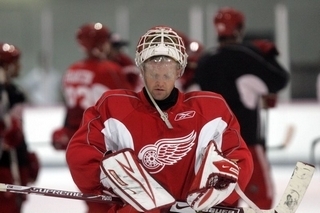 ET), the Wings could finish 5th, 6th or 7th. Right now, the Wings are tied for 5th with Nashville with 100 points; Los Angeles is 7th with 99 points. However, the Wings lose all ties with the Preds and Kings. But the Predators are done, so Nashville finishes ahead of the Wings if Detroit doesn’t get at least one point. The Preds win all ties with the Wings and Kings, who have 99 points and are 7th at the moment. The Kings can finish 5th if they get to 101 points, meaning they must win, and the Wings don’t. Whoever finishes 5th gets Phoenix. Whoever finishes 6th gets Vancouver. If the Wings win, they have 102 points and finish 5th. If the Wings get 1 point, they have 101 points. If the Kings win and tie Detroit at 101 points, the Kings get the Coyotes and the Wings play Vancouver. If the Wings lose and the Kings win, Detroit could finish 7th and play San Jose (since that means Chicago wins and takes the Western Conference by tying San Jose at 113 points). I think that covers all the possibilities. But as Dennis Miller likes to say, I could be wrong! The BIG question: Who will Mike Babcock start in goal? Mood meter: Great day in sports with the Wings game, the Masters, the Tigers and Cleveland and Paris-Roubaix in cycling. 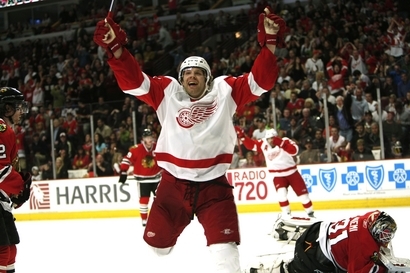 Since we last chatted, the Wings made the playoffs for the 19th-straight season. The Wings reached 100 points for the 10th-straight season. 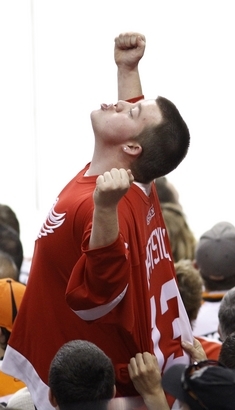 The Wings improved their post-Olympics record to 15-3-2, the best in the NHL. Game #81 (1 game remaining on Sunday at Chicago, 2 points), 100 points, 5th place. 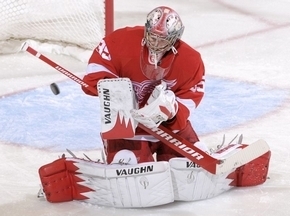 What I liked about the game: Jimmy Howard with the shutout and 22 saves … The way the Wings played the game. What I did’t like about the game: I wish scoring was easier for this team, even when it’s healthy. 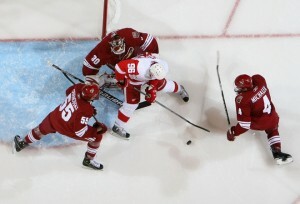 But this was playoff hockey, and the Wings look playoff ready. The BIG question: Who will the Wings play in the first round of the Stanley Cup playoffs. And, does it matter? Maybe Phoenix? Vancouver? Quote: “We got what we needed (and) got some exercise. The team played really well and everyone’s doing good.” — Mike Babcock. Mood Meter: Happy. The Wings are playoff ready.